Advanced topics on graph theory. 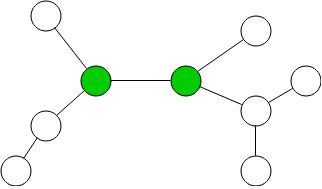 A bipartite graph is a graph which can be partitioned into two sets such that no nodes in a set connect to another node in the same set. A path is a certain order of visiting objects. A Hamiltonian Path is a path that visits every node exactly once. A Eulerian Path is a path that visited every edge exactly once. A cycle is a path that ends up at the same starting position. A Hamiltonian cycle is a cycle that visits every node exactly once at ends back at the start. A Eulerian Cycle is a cycle that visited every edge exactly once at ends back at the start. The Travelling salesman is the problem where a salesman wants to find a cycle that minimizes the total cost of weights used of edges. Some graphs may have nodes that have special properties. A node in a directed acyclic graph that has no ancestors is a root. The center of a undirected tree is the node that minimizes the sum of the distance to every other node. The center can be found be continuously stripping away leaf nodes (nodes with only one edge) layer by layer until either 1 or 2 nodes remain. The longest path in a tree will contain the center.